My garden is full of cute sparrows. They love hopping around the hedges, and sunning themselves in the shrubs. Cute photo! Is your garden sort of sheltered, Terra? He looks as if he enjoys the sunshine as much as I do! Thanks Jane, Rose, Neena and Chris .. Very clear and detailed photo. I like! The sparrow was very obliging, keeping still for the photo ! 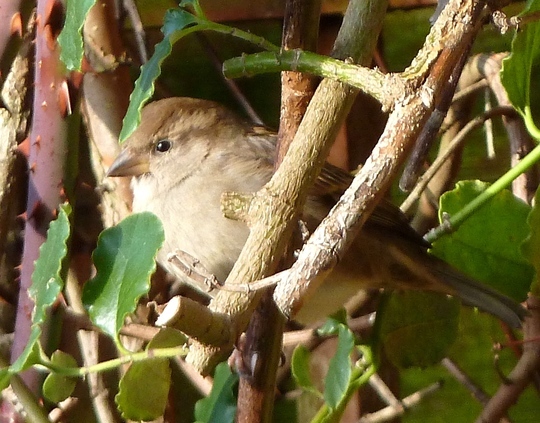 yes .. hedges are a likely place to see sparrows. Thanks Amy and Dotty ..
Loads of sparrows in my gardens. I was photographing them again today ! Lucky you, not a bird to be seen here.......so sad. Do you have bird baths ? can't wait to see them in my garden - lol operatie work might be "see"! !